You can’t imagine Edinburgh without Edinburgh Castle – it is one of the City’s landmarks, dominating the skyline, perched on a seemingly impregnable, daunting, volcanic rock at the end of The Royal Mile. On a bright day, perhaps at festival time and viewed through the colours of Princes Street Gardens, it is ambiguous; fearsome yet beguiling: but when it’s a dreich day, there is no doubt that this mighty, brooding, fortress does exactly what it says on the tin and discourages unwanted visitors. That, obviously, does not include the tourists who flock there in their thousands from all over the world. In Roman times the castle rock was occupied by a Celtic tribe known in Latin as the Votadini, whose territory spanned modern south-east Scotland and north-east England. The descendents of the Votadini were known in Celtic as the Gododdin, with a stronghold they called Din Eidyn, or Eitin. In 638AD Din Eidyn was captured by the Angles (or Anglesc, ancestors of the English), whose Germanic language changed the din (stronghold) to their own burgh – hence Edinburgh. By the 11th century or earlier, Scots – originally a tribe from Ireland – were dominating south-east Scotland. The Battle of Carham (in modern England) in 1016 secured Scots’ sovereignty at that time over this part of the world. So, it might amuse you that the ancestors of the English got to Edinburgh before the ancestors of the Scots did; or it might not. These days, of course, we’re all hybrids. By 1093, Edinburgh Castle was a royal Scots residence – though it was occupied by the English for 12 years in the 12th century. At that time, it was mostly built of wood – stone walls were erected in the 13th century. The castle fell to England’s King Edward I after a siege following the Battle of Dunbar in 1296, and the English hung onto it until 1314. Then, in one of the most daring assaults in history, Scots forces loyal to Robert the Bruce recaptured it by climbing up the rock at night. Led by the Earl of Moray and guided by a young man called William Francis, who used to live in the castle and sneak out to visit friends, they completely surprised the sentries – and the castle was once again in Scottish hands. A few months later, Robert the Bruce decisively beat the English at the Battle of Bannockburn. 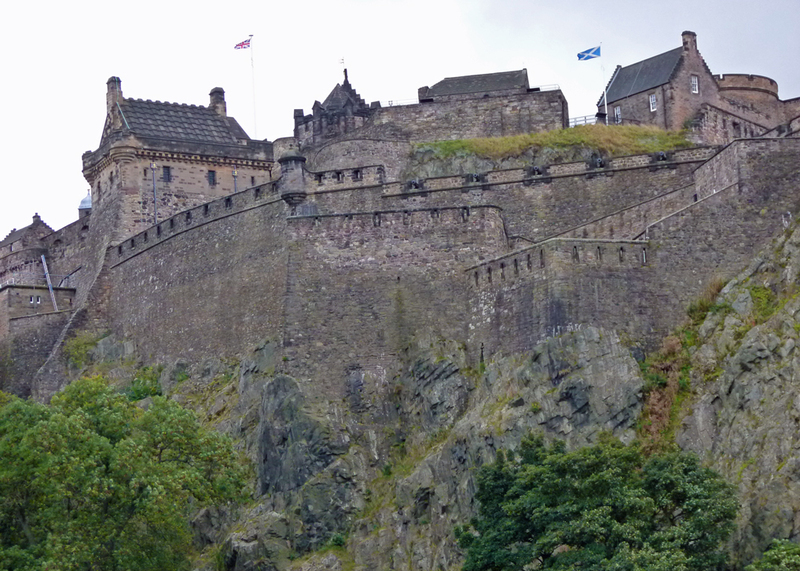 For awhile, Edinburgh Castle lay abandoned – but in 1335 it was taken again by the English, only to be recaptured a further time by Scots posing as sailors bringing provisions, led by Sir William Douglas; the English garrison was massacred. Edinburgh Castle was rebuilt under Kings David II (1329-71) and Robert II (1371-90), becoming Scotland’s premier royal stronghold. In November 1440, the infamous Black Dinner took place, which was such a hideous event that I need to tell you about it. If you are of faint heart, or already know the story, skip the next paragraph or so. James II of Scotland was just six years old in 1437 when he became king following the assassination of his father, James I. These were violent times, with rival factions vying for political control. Fearful that the Douglas clan, specifically the Black Douglases, were becoming too powerful, the Chancellor of Scotland, Sir William Crichton, and his ally Sir Alexander Livingstone of Callendar, invited the 6th Earl of Douglas, William, and his brother, David, to dinner with the ten-year old king at Edinburgh Castle. The Earl of Douglas was just sixteen and his brother only twelve. By all accounts, the three youngsters had a grand time, enjoying the food and each other’s company. Then someone brought in the head of a black bull and thumped it down on the table; this, apparently signified the end of the Douglas. Ignoring the distraught young king’s pleas, the two Douglas boys were dragged outside, declared guilty of treason, and beheaded. ‘Tis said that William begged for his brother to be executed first, so that the younger lad wouldn’t have to see his older brother’s decapitation. So many stories: in 1479, King James III’s brother Alexander, imprisoned for intriguing against his king, escaped on a rope dangling from his cell – and returned with an English army. 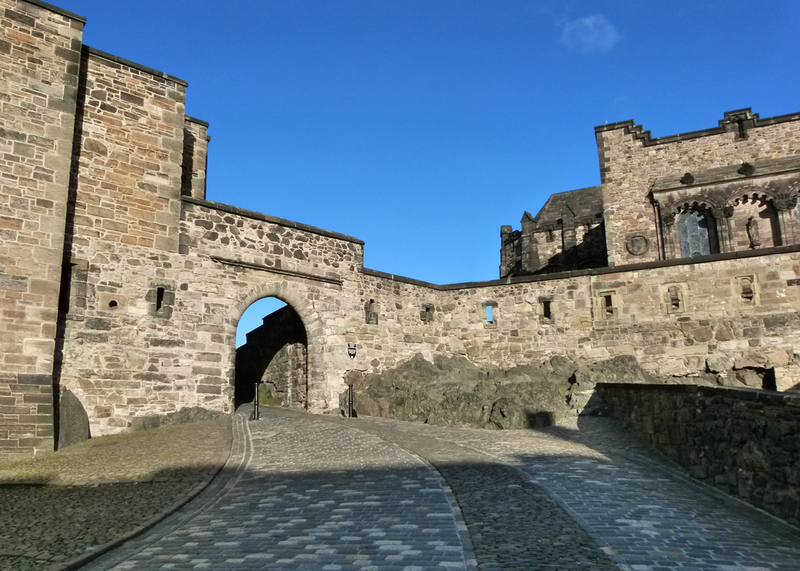 By the 16th century, Edinburgh Castle was increasingly being used as an arsenal and the Stewart kings were spending more time at the infinitely less draughty and more comfortable Palace of Holyrood at the other end of town. However, security demanded that Mary Queen of Scots gave birth to her son, the future King James VI of Scotland and I of England, within the strong walls of Edinburgh Castle. 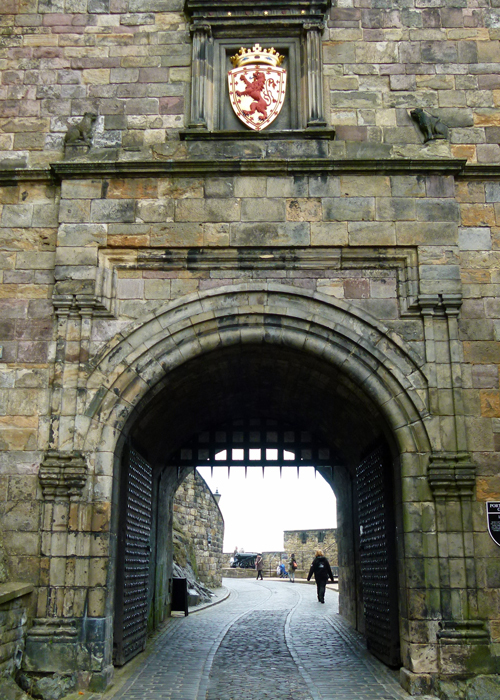 After Mary was forced to abdicate in favour of her infant son, the Governor of Edinburgh Castle, Sir William Kirkaldy, refused to surrender what he saw as Mary’s fortress to her enemies – which resulted in what is known as the Lang (long) Siege – of 1571. With the help of guns on loan from the English, the besiegers finally prevailed and poor loyal Sir William was dragged to mercat cross in the city, by St Giles’ Cathedral, and hanged. His head was subsequently displayed on the castle’s walls. All was relatively peaceful until 1639, when Presbyterian Covenanters, unhappy with Charles I’s religious policies, occupied the castle a couple of times. Then came the oddly named English Civil War, in which Scottish troops were often decisive – including when they handed Charles I over to Parliamentary forces in 1647. In Scotland, Charles II was proclaimed king in 1649 following the execution of his father, Charles I, and the influential Covenanters switched sides in support. English Parliamentary forces under Oliver Cromwell swiftly moved north. The Covenanters were defeated at Dunbar in September 1650 and, once again, Edinburgh Castle found itself under siege; it surrendered in December. The Jacobite rebellions of 1715 and 1745 largely passed Edinburgh Castle by – though briefly besieged by Jacobite forces, they failed to overcome its defences. 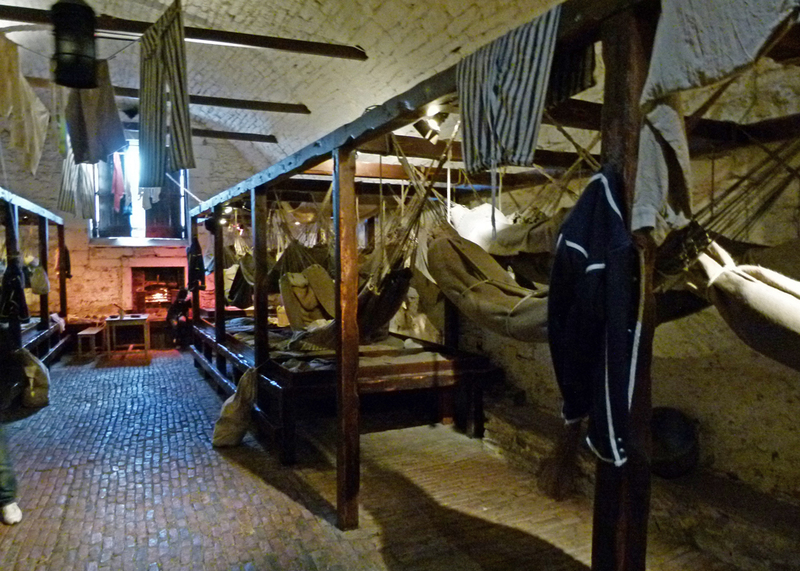 Thereafter, the castle essentially became a garrison fortress and also housed American and French prisoners of war. 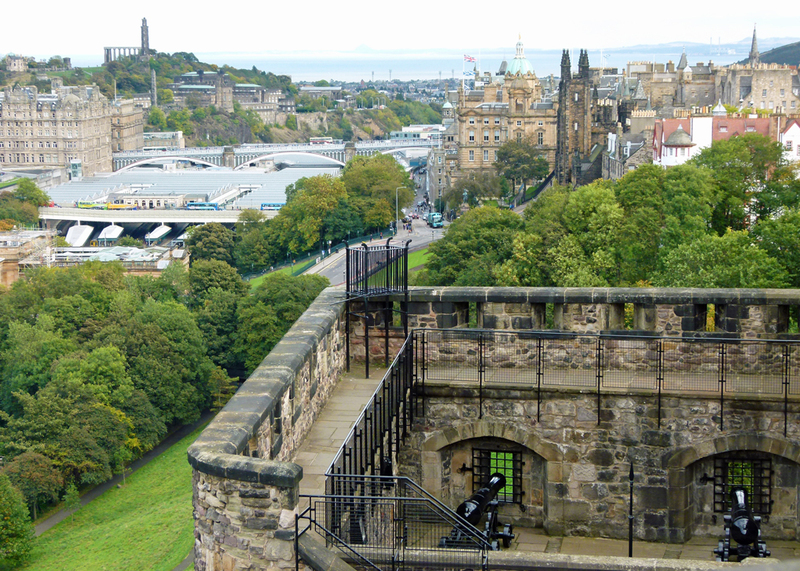 Rows of cannon line the battlements, from which there are stunning views across the City to Calton Hill, Leith – and beyond. 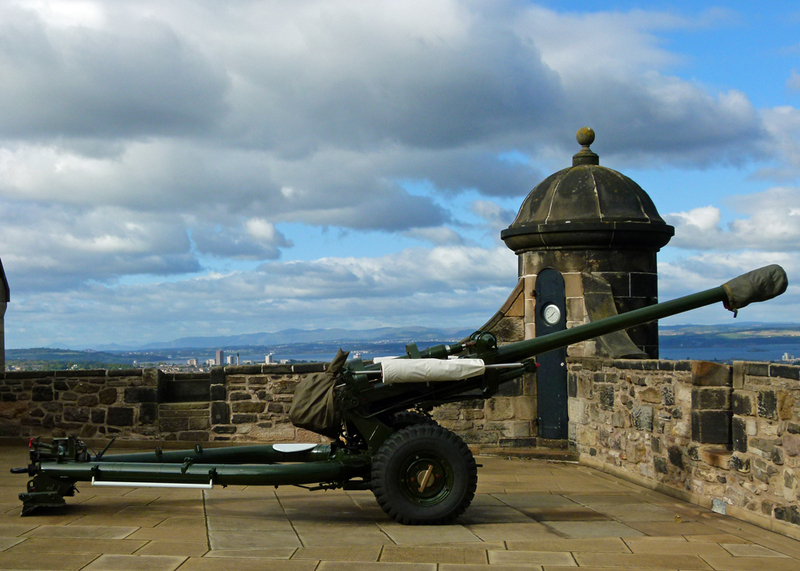 The One o’clock Gun – a field gun fired every day except Sundays, Christmas Day and Easter Day. The tradition dates back to 1861 when it was introduced to enable ships in the Firth of Forth to set the maritime clocks they needed to navigate the world’s oceans. 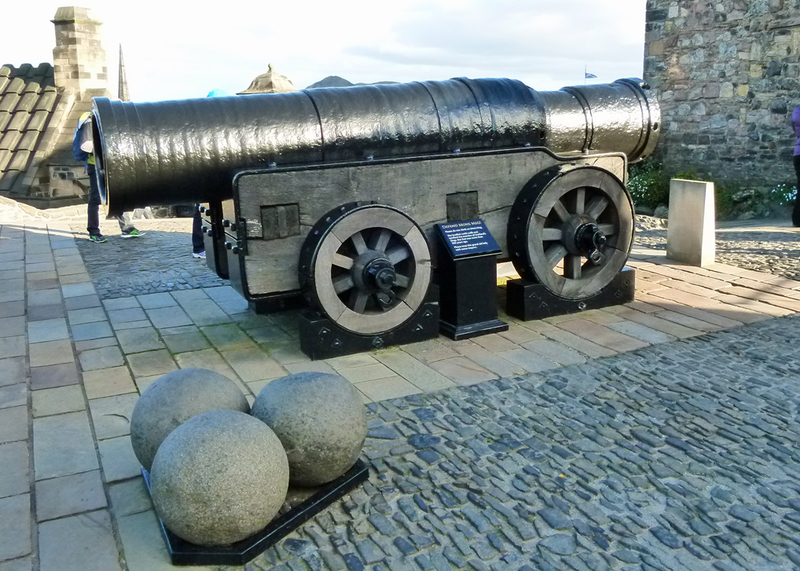 Mons Meg, a 15th century siege gun – made in Mons, Belgium, a gift to James II from the Duke of Burgundy in 1457. It was used at various sieges, but could only travel 3 miles a day. Mons Meg was fired in 1558 in celebration of Mary Queen of Scots’ wedding to Francis, the Dauphin of France. 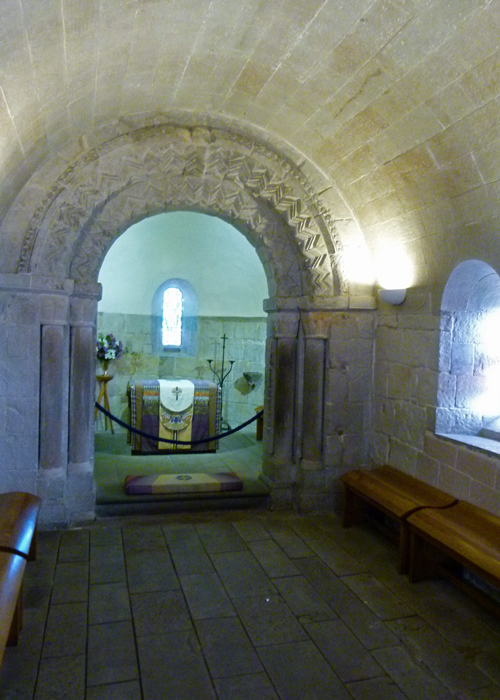 The oldest building (not just in the Castle but in Edinburgh) is the lovely St Margaret’s Chapel, built c1130 by the great King David I and dedicated to his mother. Queen Margaret of Scotland was an English princess, Margaret of Wessex, who married Malcolm III of Scotland in 1070. She was a pious woman who, amongst other charitable works, established a ferry across the Firth of Forth – thus giving us the towns of North and South Queensferry. She died at Edinburgh Castle in 1093 after hearing of her husband’s death in battle – fighting the English. 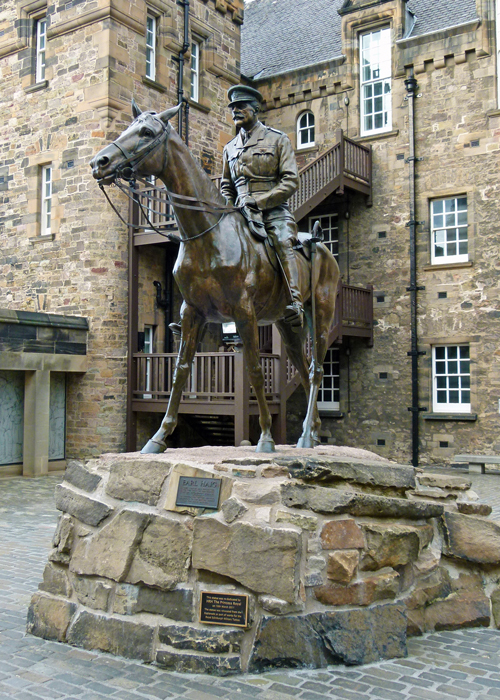 There are two regimental museums – the Royal Scots Dragoon Guards (cavalry) and the Royal Scots museums. Included in the former is the French Eagle Standard, captured by the Scots Greys at the Battle of Waterloo in 1815. The roots of the Royal Scots date back to 1633 – the oldest infantry regiment in the British Army – and the museum tells tales of battle honours won all over the world, including the stories behind six Victoria Crosses on display. Edinburgh Castle is also home to the National War Museum (of Scotland) and the Scottish National War Memorial. 20% of all Scots who enlisted in the British armed services during World War I did not return home. 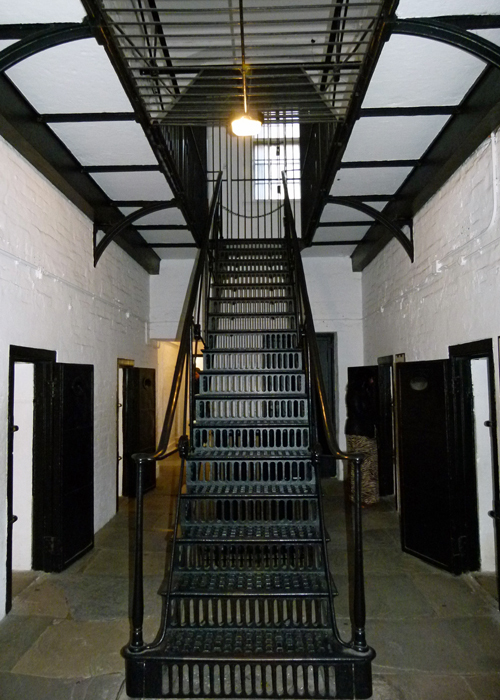 There are vaults where American, French and other prisoners of war were held – absolutely fascinating – and the small Victorian military prison. Then there is the Royal Palace – sumptuous apartments including the room where James VI of Scotland and I of England – the first monarch of both countries – was born. 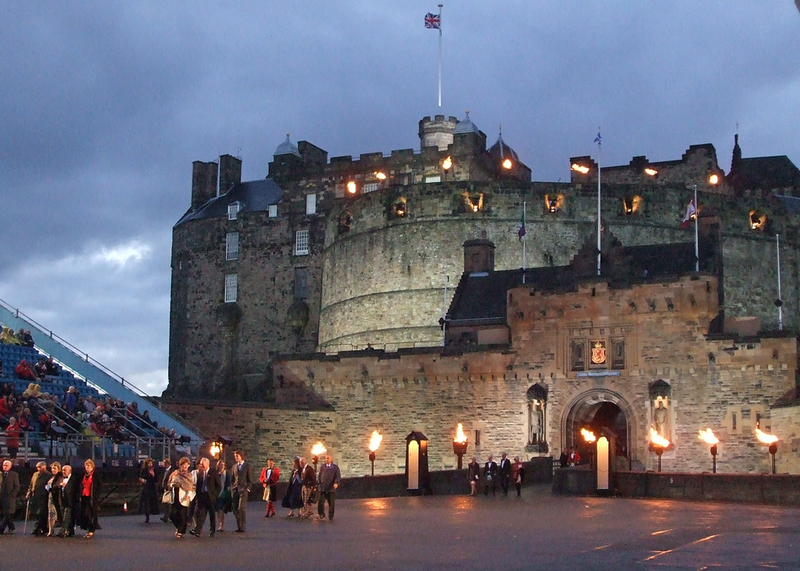 The Honours of Scotland – essentially, Scotland’s crown jewels – and the ancient Stone of Destiny – are held at Edinburgh Castle. Scottish kings were crowned on the Stone of Destiny at Scone since time out of mind, until it was removed by the English in 1296 and subsequently used in the coronations of most English and, since 1714, all British monarchs, including the present Queen. The Stone of Destiny was returned to Scotland in 1996. The Crown, Sceptre and Sword of State were first used together for the coronation of Mary Queen of Scots in 1543. The Honours were locked away after the Act of Union between England and Scotland in 1707. However, the author Walter Scott obtained permission to seek them out in 1818 and they were put on public display. They are absolutely amazing – and there is a fascinating exhibition to go with them. 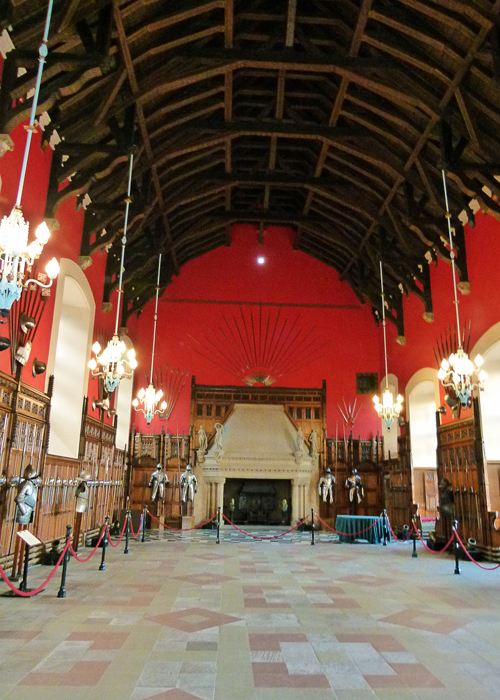 Do not miss the Great Hall – built in 1511, with a wonderful hammerbeam roof, and lined with armour and ancient weaponry. 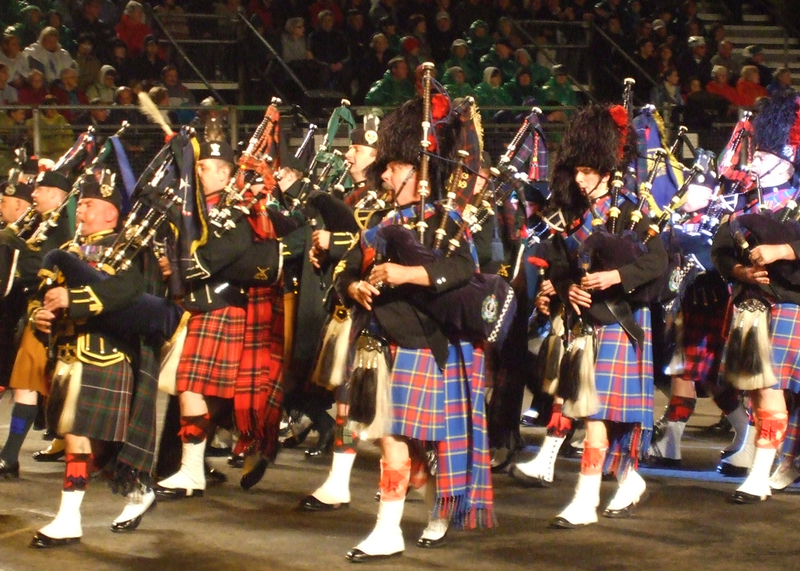 And, of course, if you’re lucky enough to be in Edinburgh in August, you can experience the festivals in the city and the military tattoo held on the esplanade in front of the castle. The backdrop of the fortress is a dramatic setting to a magnificent display. Formidable indeed- and quite a history. I’d love to see it someday. Great post on the castle! And some good photos to go with it. Lots of interesting stories there over the centuries. If anyone goes in August for the Festival, just make sure you’ve reserved accommodation long in advance! You’re right that the English got there first, but we Scots did successfully drive them out later! Ah, the good olde days. Heads on spikes decorating castle walls, sneaky late night assaults, royal prisoners and more gore than a Stephen King novel. If any place is haunted it has to be Edinburgh Castle. I loved learning more about it’s very early history. Fascinating. Why, oh why did I read that paragraph? I’m going to have nightmares all night… And you were so kind to warn us about it… But the views of the castles are beautiful! They’re a tough bunch, those Scots. Thing is, to me the image of Edinburgh Castle will always signify the wrapping around a pack of sweet but rather crumbly rock. A bit weak, compared to our PROPER Scarborough Rock that could break your teeth if you didn’t eat it right! Another very interesting read, and I loved your photographs. You have captured some fine photographs of the castle. You always research your posts so well and they make for compulsive reading! I also love your annotated photos. I hope you are on holiday/visiting and not ill? Edinburgh has been on my must visit list for so long it has cobwebs on it! I’ll be visiting Edinburgh (and other parts of Scotland) in July 2018, so I’m busily learning as much as I can about Scottish history. Having been brought up in the south of England, Scotland seemed so far away and we really didn’t learn much about what went on there. My main memories of Scotland are tins of shortbread at Christmas and watching Andy Stewart on the telly at Hogmanay! Hi Mike – I hope all is well … take care and see you when you can get back to visiting. 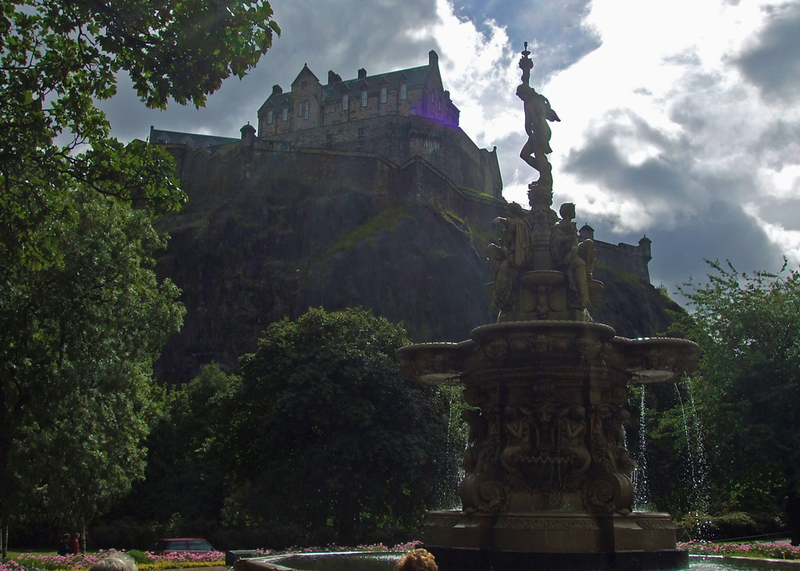 Edinburgh – amazing history … so convoluted – I’ve never grasped Scottish history – English is bad enough … let alone all the European connections … but each small piece is another bit of the puzzle of these lands. I’d love to see the Honours of Scotland – they sound fascinating … while the Great Hall is stupendous isn’t it – love the red walls … cheers one up on those dreich days. I was there when I was about 15 and the Tattoo was on – not sure if we saw it … meaning I certainly didn’t take it in. I remember the saltwater Portobello baths with a wave machine!! History of our two countries dominates the latest England vs Scotland political problems. I still want any country to beat Scotland at Rugby & Football ! That seems a little harsh; there are plenty of Scots who feel that way about England, unfortunately. Such a violent history, incredible fortress, great photos, and particularly interesting to me are the Covenanters (The RPCNA , a rather small denomination on the US, traces its history to the Covenanters), and also the Stone of Destiny, wondering why they returned it after 700 years, and will they borrow it again when William (or Charles) becomes king, for tradition’s sake? I would think that symbolically, the Scots wouldn’t approve, but… Great post Mike! Fascinating! Thanks for leaving a comment. Ta very much. Yes, it’s intended to use the Stone of Destiny at all coronations of UK monarchs. Thankfully the civilian parts of the castle are well worth inspecting – the Great Hall, the royal palace, the chapel etc. Have only been very briefly to Scotland and never to Edinburgh, fascinating post. Seems that the Scots were often their own worst enemies. Can’t wait to see it in person. Great overview for our impending visit there. This blog post was too much take in! I can’t imagine a day would be anywhere near enough time to explore this intriguing place. What a history! I’m definitely not missing Edinburg when I eventually travel to Scotland! Thanks for the fantastic post. Informative and fascinating! Wonderful post!